Earlier this month I had the chance to meet Anita Moorjani, author of Dying To Be Me, a powerful and inspiring memoir chronicling her Near Death Experience and unexplainable healing from terminal cancer. 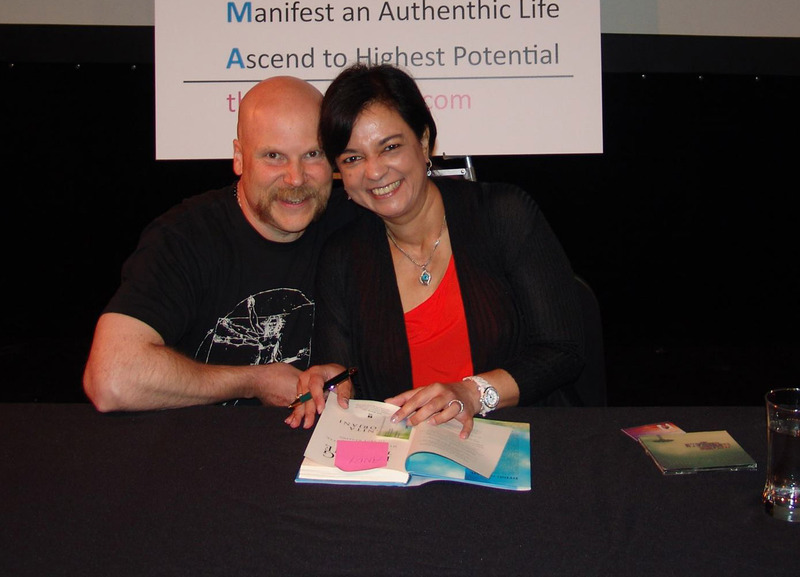 I first heard of Anita in early 2012 while reading Wayne Dyer’s excellent book, Wishes Fulfilled. He told a bit of her story and shared her primary message of unconditional self love. I bought her book a month or so later, but didn’t read it. I wanted to. I had time to. But I was scared. Everything I read or heard about Anita and her story resonated so strongly with me, so many of her words matched exactly what I’ve said in my own speeches that I was scared to read it. I was concerned that I’d be “ripping her off.” So I ignored the book for more than a year. This July I took Anita’s online class with Hay House. I loved it. I felt like I could have been teaching so much of it. Still I didn’t want to read the book. Finally, two days before I was going to see her speak in Hartford CT on Sept 14, 2013, I read her book. I devoured it, inhaled it, and I immediately got that it was the Truth. That is why it resonated so strongly with me, and why so many of her words seemed to be my own. We are both sharing the Truth. I laughed at myself as I understood that I couldn’t “rip off” the Truth. I got to spend a few minutes with Anita after her presentation. Her presence and energy are AMAZING; pure love. I shared with her how I learned the importance of self-love after multiple suicide attempts, and we had a good laugh over my resistance to reading her book. She gave me a kiss and said to keep doing what I’m doing. Deal. Here is a metaphor she uses in her book and presentations that I really like. I can’t recommend her book enough! And you don’t have to face your own death to learn these lessons. Enjoy. Although I try to share my near-death experience, there are no words that can come close to describing its depth and the amount of knowledge that came flooding through. So the best way to express it is through the use of metaphors and analogies. Hopefully, they capture a part of the essence of what I’m trying to convey at least in some small way. Imagine, if you will, a huge, dark warehouse. You live there with only one flashlight to see by. Everything you know about what’s contained within this enormous space is what you’ve seen by the beam of one small flashlight. Whenever you want to look for something, you may or may not find it, but that doesn’t mean the thing doesn’t exist. It’s there, but you just haven’t shone your light on it. And even when you do, the object you see may be difficult to make out. You may get a fairly clear idea of it, but often you’re left wondering. You can only see what your light is focused on, and only identify that which you already know. That is what physical life is like. We’re only aware of what we focus our senses on at any given time, and we can only understand what is already familiar. Next, imagine that one day, someone flicks on a switch. There for the first time, in a sudden burst of brilliance and sound and color, you can see the entire warehouse, and it’s nothing like anything you’d ever imagined. Lights are blinking, flashing, glowing, and shooting sparks of red, yellow, blue, and green. You see colors you don’t recognize, ones you’ve never seen before. Music floods the room with fantastic, kaleidoscopic, surround-sound melodies you’ve never heard before. Neon signs pulse and boogie in rainbow strobes of cherry, lemon, vermillion, grape, lavender, and gold. Electric toys run on tracks up, down, and around shelves stacked with indescribable colored boxes, packages, papers, pencils, paints, inks, cans of food, packages of multihued candies, bottles of effervescent sodas, chocolates of every possible variety, champagne, and wines from every corner of the world. Skyrockets suddenly explode in starbursts, setting off sparkling flowers, cascades of cold fire, whistling embers, and animations of light. The vastness, complexity, depth, and breadth of everything going on around you is almost overwhelming. You can’t see all the way to the end of the space, and you know there’s more to it than what you can take in from this torrent that’s tantalizing your senses and emotions. But you do get a strong feeling that you’re actually part of something alive, infinite, and altogether fantastic, that you are part of a large and unfolding tapestry that goes beyond sight and sound. You understand that what you used to think was your reality was, in fact, hardly a speck within the vast wonder that surrounds you. You can see how all the various parts are interrelated, how they all play off each other, how everything fits. You notice just how many different things there are in the warehouse that you’d never seen, never even dreamed of existing in such splendor and glory of color, sound, and texture—but here they are, along with everything you already knew. And even the objects you were aware of have an entirely new context so that they, too, seem completely new and strangely super-real. Even when the switch goes back off, nothing can take away your understanding and clarity, the wonder and beauty, or the fabulous aliveness of the experience. Nothing can ever cancel your knowledge of all that exists in the warehouse. You’re now far more aware of what’s there, how to access it, and what’s possible than you ever were with your little flashlight. And you’re left with a sense of awe over everything you experienced in those blindingly lucid moments. Life has taken on a different meaning, and your new experiences moving forward are created from this awareness. After her cancer diagnosis in 2002, Anita Moorjani experienced what most of us never have – she “crossed over” and came back to share what she learned. Her remarkable near death experience (NDE) and subsequent healing is one of the most amazing ever recorded. Anita’s NDE tremendously changed her perspective on life, and inspired her critically-acclaimed New York Times best-selling book, Dying To Be Me. Her work is now ingrained with the depths and insights she gained while in the other realm and has propelled her to the forefront of the world of personal transformation and NDE. She is the embodiment of the truth that we all have the inner power and wisdom to overcome even life’s most adverse situations, as she’s the living proof of this possibility. Leave a comment for: "Meeting Anita Moorjani"